Mother’s Day has come and gone and every year the pressure is on for my kids and hubby and ME to make ME feel special on Mother’s Day. “Get out of dinner free” is a surety, whether it’s replaced by the hubby manly-man-grill-action thing on the deck or eating out. And someone, even if it’s ME, can buy ME flowers. Or perfume. Or jewelry. Or a new spring outfit. Hey, in this liberated age, women (better!) know how to look out for themselves. My mother passed away 13 years ago. I have to admit that I was always a little miffed at her for bestowing on us, what I considered to be, a chintzy wedding gift thirty years ago: an incomplete china set my parents had inherited from my dad’s aunt. “You might use this.” Yeah, mom. I had grown up with that ancient decrepit box of incomplete china from my dad’s aunt, which remained forever unpacked, carted along with every move, always relegated to storage somewhere. My mother gave it to me, finally, and as far I was concerned, our wedding was her opportunity to rid herself of it. 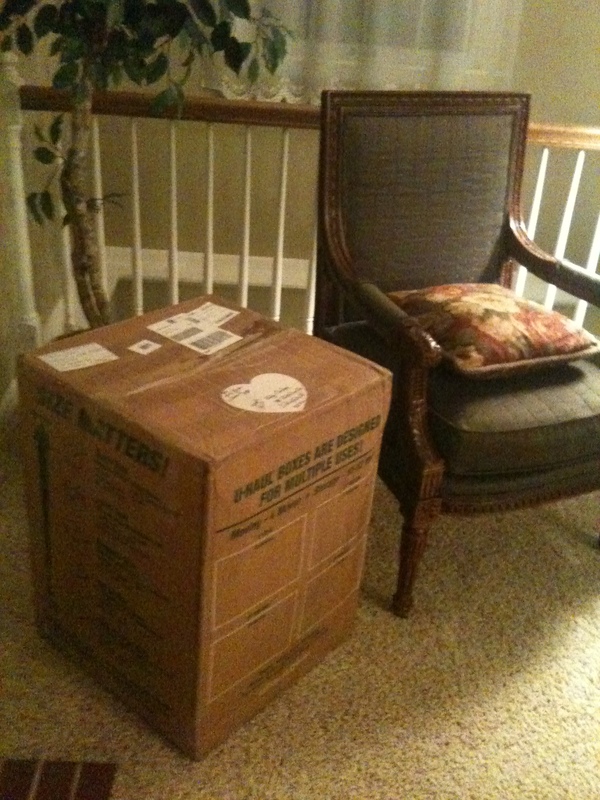 Alas, we lugged the box of china from one storage place to another through our first twenty years of marriage. 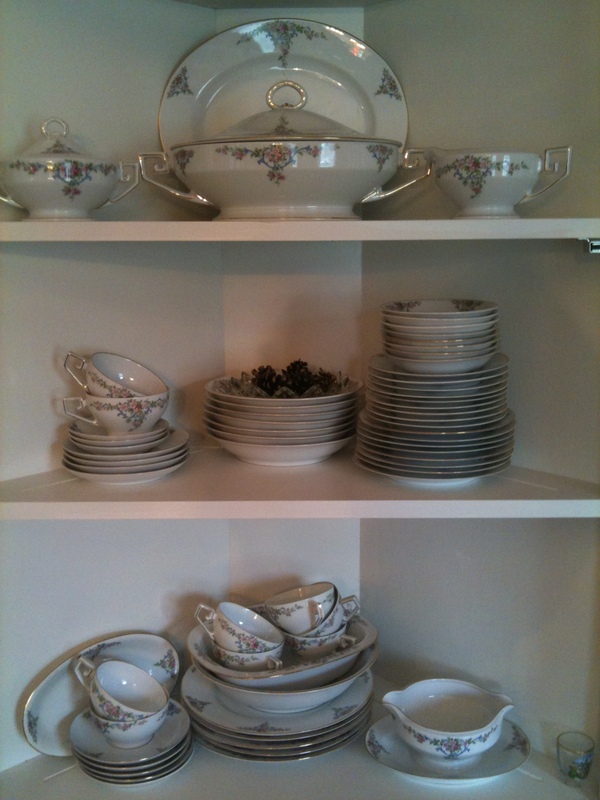 Then, ten years ago, we bought a house that had two built-in corner china cabinets in the dining room. 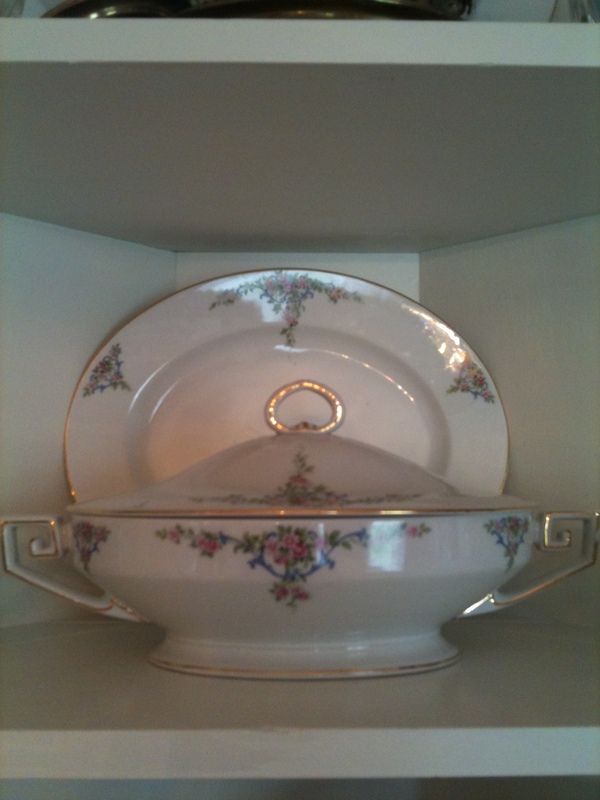 I unpacked that delicate old china and displayed it in one of the cabinets. Hmmm. Nice to look at, but we’ll never use it! It only has 5 dinner plates! We have a creamer here, but no sugar bowl. Missing 3 coffee cups and saucers, two soup bowls, 3 dessert bowls, and several pieces are chipped, to boot. A couple of weeks before Mother’s Day I was chatting on the phone with my younger sister, Lisa, who collects dishes, and mentioned that china set. Did she want it? I described it to her, along with my gripe about how we ended up with the set in the first place. I did check it out and thought the idea ludicrous. But then I started thinking about my mother, and me, and how maybe her giving me that set represented a loving, special act that had been lost on me. After all, my parents had eight kids, I was their third daughter. Maybe I had been a totally unappreciative, spoiled, shallow, rotten brat about this, after all, it was me she had gifted that set to, and what the heck was I so miffed about? So, of course, I did the only noble thing I could do at this juncture – in honor of myself and my mother on Mother’s Day!! I embarked with unbridled fervor on a mission to complete the set. Pored over those internet sites. Only, I don’t know a thing about eBay. I have never ordered a thing off eBay, that I recall. So, I started clicking on those sites. I set up my eBay account, and … look here! Someone is selling four coffee cups, three bowls, three plates, plus a covered sugar bowl, in my set at a super bargain! Just for me! I know it! It’s a God thing! “Cha-ching!” Done! ‘Pay Pal’ is a swell pal of mine! Oh, an extra 20 bucks for shipping. Oh well. Just DO it! Order now so it gets here in time for Mother’s Day! I found another great buy (relative to what, one might ask) from another seller – on a covered vegetable dish with my name on it. Click! Pay pal, enter password … done! The covered vegetable dish arrived within 3 days. It was stunning! I set it on our dining room table and raised the lid on it, imagining steam rising up into my face from a heap of creamed brocolli at Easter dinner. I arranged it in the corner cabinet with my other dishes. Isn’t it beautiful!!! The package containing the cups and saucers, plates, and bowls arrived. Uh… gees, the gold edge is worn clear off most of the dishes. And the saucers are literally stained from…. USE! Yuck! No wonder they were such a great buy. (Guess I should have read the fine print on these a little more closely??) I stacked the dishes up with the ones I had. You can’t really tell the three dessert bowls I just got from the ones I already had, right? Of course you can! Crap! I could use those bowls as Easter cat dishes or something? That’s annoying! Oh joy. 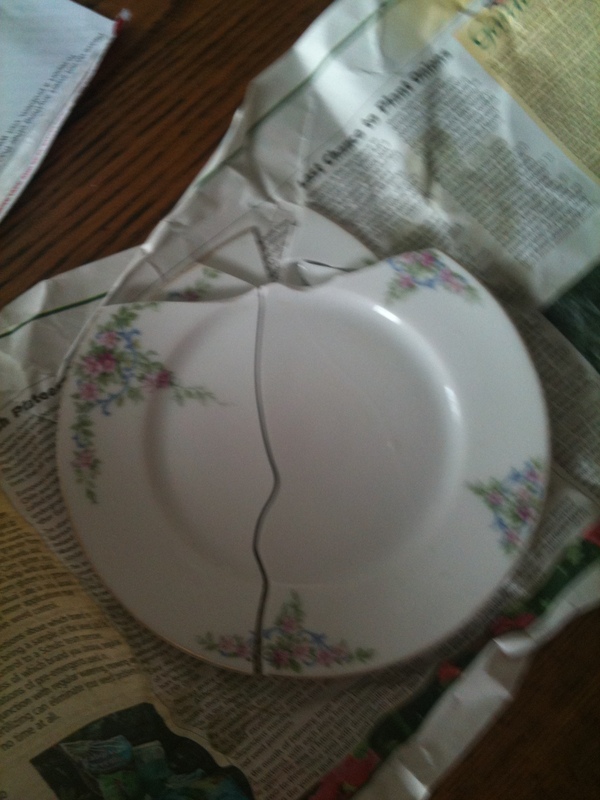 And this plate arrived broken. So now I deal with the seller on that? The lost $9.99 plus shipping to replace it? Checking out the sites, it is clear that any piece of this china in good condition is going to start at 9.99. Plus shipping. Double crap! After spending on myself for Mother’s Day, uh, the cost equivalent of a family meal out, two dozen red roses, a new spring outfit, and a pedicure, I have … well, okay so I still need three dinner plates, two soup bowls, replacements for those worn dessert bowls, four sandwich plates … and that’s just to complete service for eight. Okay, so that’s 9.99 – 15.99 plus shipping times about … fifteen? That’s it!! This is nuts! Ahhhh! Lookee here! 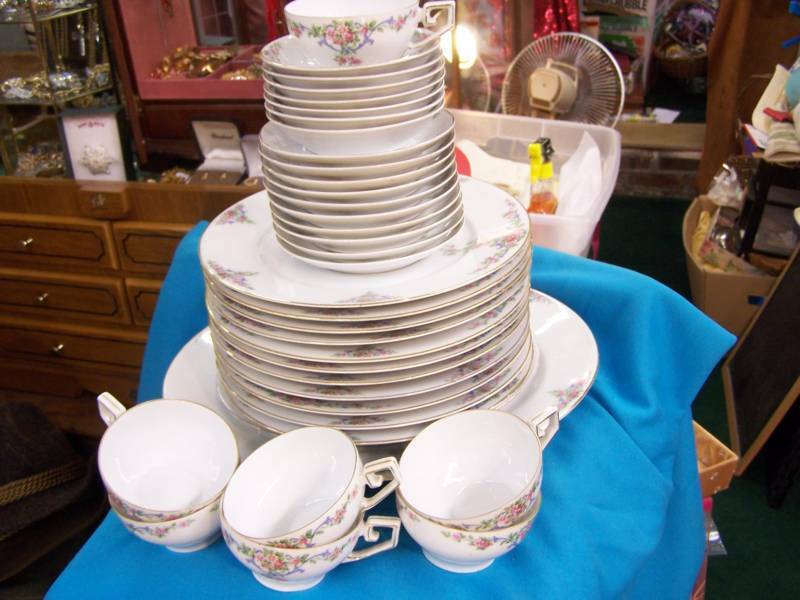 A photo of the 37 pieces of 1927 German Tirschenreuth ‘The Eton’ china for sale on eBay!! 37 pieces in near-new condition! – at a mere price of 149.99! (do the math here – ahem, it’s an average of about 4 bucks a dish!) And a mere fifty bucks for shipping! That should cover it! I’m doing it. I’m totally springing for this purchase and getting this exercise over with! 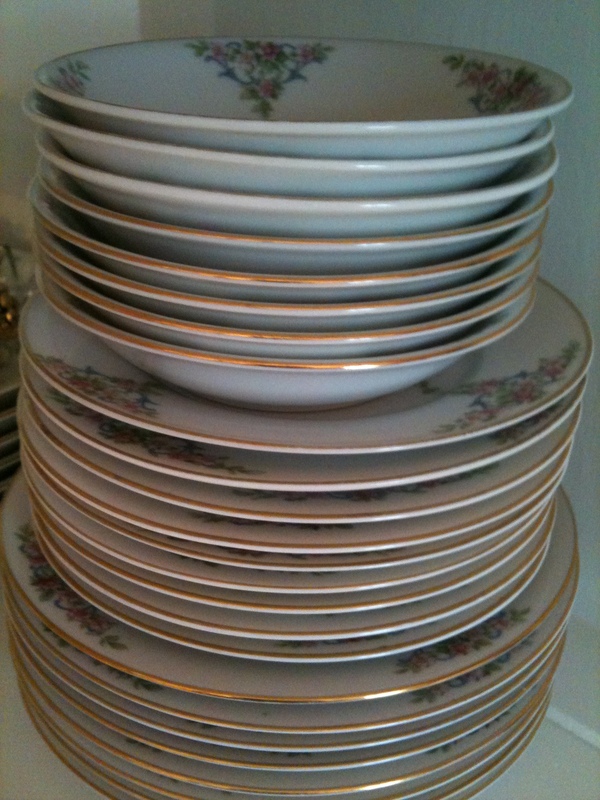 The Mother lode of the German Tirschenreuth ‘The Eton’ china. Coming my way! The box arrived a couple of days ago. I’ve wrestled the monstrous thing into a corner of our living room. Can’t quite muster up the energy to deal with it. I gotta open it, unpack the dishes, you know, might want to see if all 37 pieces arrived intact and figure out how I’m going to shove them all in with the rest of the set in that corner cabinet. But hey! You want to attend a formal dinner for twelve or sixteen or maybe twenty at my house? Got it covered! Except, the gravy bowl is chipped. Whatever. I’m calling this project ‘done’. Meanwhile, the box containing the ‘mother lode’ could double as a card table or something in our living room until I feel like dealing with it. Now, Do you suppose in about twenty years I should divide this set up so I can pass down two incomplete sets to my kids? Well, I’m pretty sure www.replacements.com will still be in business by then. You are currently browsing the The Decompression of a Boomer blog archives for May, 2011.